The RV Doctor: Friends of Gary! "Our Keystone RV has very little storage. It came with only one closet that is double the width we need so we divided it in half and then installed drawers on ball bearing runners to give us somewhere to keep cutlery and kitchen items. By the second trip out, the movement of the trailer caused the drawers to shift out of square and are now unusable because they sit at an angle in the cabinet. Our next idea is to build an independent cabinet with the drawers and just place it inside the existing cabinet. Is there a proper way to build a drawer cabinet that will not shift and blow apart while driving? Please help! I know you get tons of requests but I am desperate. It's been one issue after another and I really need something to go right with this trailer. Thanks very much. Nancy"
1) Assemble the structure holding the drawer slides carefully, and make sure the joints are secured well. I like using a pneumatic stapler, as they do in the factories, but I will back it up, as needed, with glue and screws. 2) Choose your drawer slides carefully. RV industry drawer slides are self-locking. I’ll bet the drawer slides you used weren’t which led to the drawers banging around until they broke. RV drawer slides, like those from AP Products and others, are designed for this purpose, and your RV service and parts supplier can help you with this selection. 3) The drawers need to be stronger than the average drawer. If you are making them yourself, most people can’t make mortise and tenon joints, but there are other options. Particle board for drawers in an RV is a no-no. Use solid wood, and if you can’t make an advanced joint, consider using thicker than normal wood, and glue it and screw it…and dowels, properly glued, help a great deal. Remember, the drawer front needs to be wider and taller than the rest of the drawer to hold it in place, and should be made of a hard wood. When securing the entire cabinet, again, remember that it is moving with the RV, so it will need to be secured on the bottom, sides and back, if possible. Kitchen ‘stuff’ is heavy, so the structure of the drawer pack should be able to sustain this. 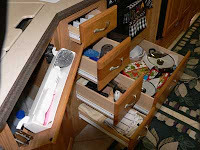 Another option would be to find a sliding wire drawer assembly similar to Closet Maid style shelving, the caveat being that it has to be strong enough to put up with the pounding, and it must be well secured to the RV.